We have provided a list of FAQs’ because over the years Customer’s would ask some really great questions. Similarly, several customers would provide relevant suggestions. So, we included several of them here on the FAQ’s page. Skylights, painting a roof, attic ventilation, how long will it take to install a roof, new roof cost and so much more. We even included a question that was asked “What’s on your Roof?”. 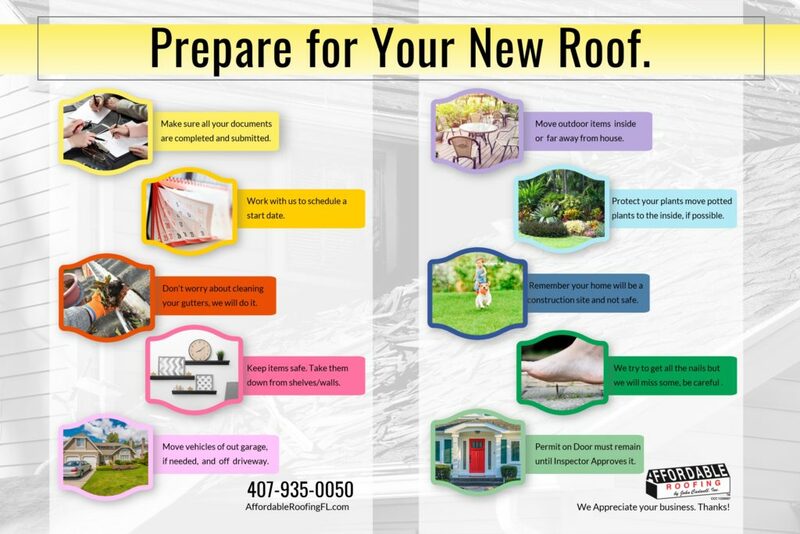 Note: Some of the information is based on the bulletins and publications supplied by Manufactures, Build Codes, and other professional roofing associations. Any tips for walking on a tile roof? What % of roof damage is required to have a new roof installed? How do I complete the Notice of Commencement (NOC)? We will email you the Notice of Commencement (NOC). You can use our easy to understand NOC Guideline. Click Here to open the page to view the NOC Guideline. Please contact us at 407-935-0050 if you have any questions. Once completed we will need the ORIGINAL back. We are unable to accept copies. Does your company use the AOB or Assignment of Benefits form? Why is it important to have a computer generated estimate over the written estimate? We don’t “guesstimate” your estimate – we offer professional and accurate estimates along with fair and equal pricing. What does the Roofing Contractor, John Cadwell, have on his own home? Contractor John Cadwell’s home is designed with a hip roof and a tile roof. What types of Workmanship Warranties are offered? Affordable Roofing by John Cadwell, Inc offers up to 15 years Limited Workmanship Warranties. Unlike most of our competition we provide a Written Workmanship Warranty. Ask us for details of our warranty. What type of Material warranties does Affordable Roofing by John Cadwell, Inc. offer? All Shingle, Metal, Tile, Modified, and Restoration roofing systems come with Manufacture Warranties which varies. View a listing of several manufacture warranties on our Warranty page to compare. We understand that there are several types of roofing materials, however, we do not offer certain roofing materials to customers, because in our 2 Decades of roofing in Florida and hearing responses from our customers and dealing with manufactures we do not recommend certain products that have had, in our opinion, poor customer and contractor responses from the manufacturer. Our interest is always the customer not our own special interest. Why do I need to maintain my roof? Roofs all need maintenance just like a car. Small isolate problems can cause your roof to have a shorter life span. Regular inspections can add to the life of your roof. Problems left undetected or ignored will over time cause extensive and expensive repairs or even replacement. Gutters need to be cleaned out at least twice a year. Caulking all windows, doors and other openings yearly is also a key part of maintenance. All roof systems are susceptible to deterioration brought on by chemical and physical stresses that represent the normal aging process. As this deterioration occurs, small isolated problems such as leaks and loose shingles can not only accelerate the aging process, but also create a situation where your roof will fail. If left undetected, these small problems can escalate over time until the damage is more extensive, and expensive to correct. We do not recommend painting your roof; however, specific roof waterproof coating systems may be applied to most roofs. Ask us for details. A few local government agencies and private companies have started recycle programs for used shingles. The shingles can be recycled into road paving material and other materials. We do recycle roofing shingles if your jobsite is located with an area that offers it. Check out our Recycling page for more information. What are low slope roofs? Roofs that have slopes of 4:12 or less are considered to be low slope roofs. (4:12 means a vertical rise of 4 inches for every 12 inch horizontal run, or 18.4°). Never apply asphalt shingles to slopes that are below 2:12 (9.5°). Shingles applied on low slopes do not last as long as shingles on steeper roof pitches, due to the increased exposure to sunlight and other weather conditions. Generally, laminated/architectural shingles are better suited to steep roofs, and do not offer aesthetic benefits when applied on low slopes. Is the design or style of the roof important? Although the roof design may be beautiful it does not mean it is functional. Troublesome and costly roofing problems are often the result of faulty initial design of the roof system. Water should always flow easily away from the roofing system. All downspouts should be diverted away from all roofs. Standing/Ponding water for any amount of time will without doubt cause damage. Make sure that your roof is always designed properly. Should I hang Christmas lights on my roof? Does installing satellites or A/C units on my roof hurt my roof? A/C units and other kinds of equipment that cause a vibration on roofs may result in the premature failure of roofing systems. All equipment should be maintained on a regular basis. What is your recommendation concerning trees and leaves on the roof? Tree branches touching a roof will scratch and gouge roofing materials when the branches are blown by the wind. Falling branches from overhanging trees can damage, or even puncture, shingles and other roofing materials. Leaves on a roof system’s surface retain moisture and cause rot, and leaves in the gutters block drainage. Moss can grow on moist wood shingles and shakes and algae also can grow in shaded, damp areas. Once it grows, moss or algae holds even more moisture to a roof system’s surface, causing rot and deterioration in addition to a greenish-black stain. In addition, moss roots also can work their way into a wood deck and structure. Trees and shrubs should be trimmed away from homes and buildings to eliminate damp, shaded areas, and gutters should be kept clean to ensure good drainage. How does the Rain, Condensation, and Wind affect my roof? Once water gets underneath shingles, shakes or other roofing materials, it can work it’s way to the roof deck and cause the roof structure to rot. Extra moisture encourages mildew, mold and rot elsewhere in a house. Condensation can result from the build-up of relatively warm, moisture-laden air. Moisture in a poorly ventilated attic promotes decay of wood sheathing and rafters, possibly destroying a roof structure. Sufficient attic ventilation can be achieved by installing larger or additional vents and will help alleviate problems because the attic air temperature will be closer to the outside air temperature. High winds can lift shingles’ edges (or other roofing materials) and force water and debris underneath them. Extremely high winds can cause extensive damage. How does the Sun affect my roof? Ultraviolet rays and heat can cause roofing materials to become dry and brittle and to deteriorate over time. Areas of the greatest concerns would be on the south and west side of the building where deterioration can occur faster. Unfortunately, roofs are not maintenance free and should be blown off and inspected at least once a year. On homes with valleys, where two roof planes meet at a downward sloping angle, debris may become impacted which could lead to water damage. Tile roofs may require more frequent maintenance as leaves and debris can get stuck underneath the tiles. Routine maintenance can be anything from keeping drains and gutters clean to cutting back tree branches. Some roofs that have shading may show signs of algae which should be removed by a roofing professional not a pressure washing company. Gutters should be cleaned at least once in the spring and once in the fall. Failing to clean out gutters could cause water to back up into the roof system and create dry-rot, interior damage, or mold. When cleaning gutters, make sure to flush downspouts. Clogged downspouts could cause water to back up into the house. Roofing, like any other material, will deteriorate with time. A new roof can last between 10 and 50 years depending on the roofing material and how well it’s maintained. Choosing the right contractor will also contribute to the length your roof will last. Experienced contractors will make fewer mistakes than novice roofers. Some companies may cut corners and deliver an inferior product in order to keep their costs down. Many owners neglect their roofs and fail to maintain them properly because they are unaware that their roof needs maintenance or because they think it will cost too much. Any one of these factors could shorten the life of your roof. What sizes do Valances come in? Currently Affordable Roofing by John Cadwell, Inc. is only able to provide Valances in 6” sizes. Call our office to get up-to-date changes to this answer. What type of valley options do you offer? With over 20 years of providing roofs to businesses and residents of Florida, and with thousands of successful, watertight roof installations, and the best written labor warranty in the industry Affordable Roofing will only do closed valleys, also known as weaved valleys for shingles and open valleys for metal roofs and tile roofs. How your roofing company installs a roof valley can define their roofing skills and really show there experience and knowledge and at Affordable Roofing we will not do your roof valley with the other inferior valley options. Are owners able to provide their own materials? However, owners are responsible for making sure materials meet the required standard and are approved for use in Florida according to their local County or City Building Department. Don’t be surprised to find out that not all materials sold or delivered in Florida are approved for use in Florida. This was especially apparent during the Hurricanes of 2004. Materials were shipped into Florida that were tested for use in Snow states, not Hurricane states like Florida. Different roof coverings have different ratings. If you require a review of your products or a breakdown list of what you will need we will provide this for an additional charge. Affordable Roofing will not be responsible for the quality or durability of the materials nor will a workmanship warranty be offered. Contact Affordable Roofing for more details. What are eave vents and ridge-vents, and why do I need them? A skylight is a structure that allows light on the roof to travel to the interior of a building. Skylights are particularly useful in spaces that do not receive much natural daylight; for example, walk-in-closet, hallways and rooms next to patios or verandahs. What is drip edge or eave edge? Drip edge, aka eaves edge metal, is used for water shedding at the eaves and rakes and for preventing wood materials from rotting. It is important that the drip edge is made of a corrosive-resitant material that extends back from the roof edges and bends downward over them. What type of fasteners does Affordable Roofing use? Affordable Roofing by John Cadwell, Inc agrees with the and supports the current building code standards that nails are the preferred method of fastening asphalt shingles and screws for metal and tile roofs. A minimum of 6 fasteners for whole shingles. What type of underlayment do you recommend for Shingles? We recommend using a “Peel and Stick” or self adhesive underlayment. Are there any financial advantages for using Energy Star™ approved roofing materials? An average homes exterior is over 40% roofing material. > Know your style. Are you inspired by nature, art, history? Do you have a modern, ranch, or traditional style of architecture? Style helps decided on materials. > Once you know your style you can select your materials. Materials will then offer different color options. > Be aware of the energy savings you can have by using certain colors. Looking to save money with your energy bills? Look for Energy Saving products. Several light color roofing products are more then just attractive they can actually save you money. > Compare your neighbor’s homes. Do you have a HOA? You may have a limited color selection approved already. If you don’t have a HOA you will still want to look at your neighborhood to decide on your color. > Curb appeal. Neutral colors tend to have the best curb appeal, Browns and Grays are the most popular color options and tend to go with most house colors. Green, blue, black, and white can be used to help standout without making a huge statement. Reds are usually used for specific styles such as Mediterranean or Barn style. Call Affordable Roofing by John Cadwell, Inc. today to schedule your estimate so we can help you in your process. We help make your decision easy. We can provide you actual roofing product samples to see in person. Architectural shingles are a type of shingle that appears or tends to look like a wood or shake shingle. It is a composite material, like a normal 3 tab, but its design and how it lays makes it a more durable shingle with a longer warranty. What Roofs do we provide Waterproofing or Restoration on? Replacing a roof is a labor-intensive project. It could take anywhere from 1 day to 2 or more weeks depending on the size of the roof and the amount of damage. Like many construction trades, roofing is substantially affected by the weather. Poor weather conditions could delay a project or prevent crews from finishing a job already in progress. Permitting inspections can also cause delays in the roof installation time frame. 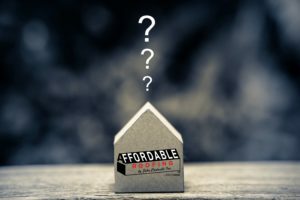 Does Affordable Roofing by John Cadwell, Inc. tie in to existing roof systems? Yes, but we only offer our Limited Workmanship Warranty to the work we performed not including Tied-In areas. If you are interested in a whole roof Workmanship Warranty a Roof Certification will need to be performed at a additional charge. Ask us for details. Can I put a new roof over the old roof? The condition of the existing roof determines whether you can add another layer of roofing materials. Relaying is not recommended for roofs with existing shingles that are curling, moss covered or splitting. The contractor should inspect the roof for sagging or rotting decking, which indicates problems requiring more than a simple addition of new roofing materials. The type of shingles for the new roof must be of the same material as the original roof. When placed over heavyweight shingles, lightweight shingles reveal all the ridges and lines from the original roof. Metal Roof-overs may also be an option. The Uniform Building Code states that only two layers of roofing material will be allowed on any residence, so there can only be 1 layer of existing roof. It is typically better to remove and replace the roof, this will allow any existing sheathing damaged to be exposed and corrected whereas a Roof-over does not permit this. Most solar panels are bolted or mounted onto the roof and will have to be removed by a licensed professional. The size and complexity of the panels will determine the cost of proper removal and re-installation. Removing solar panels ensures that the new roof will be installed correctly. While most roofing companies have owners remove the panels and then just leave them down for the owners to arrange to have them reinstalled, we offer an all-inclusive package and handle your removal and set up for you. As a rule, the vibrations from removal or installation of roofing materials may cause items to shift or fall from the walls and shelves. You may opt to cover anything in the attic with plastic or a sheet as it will get dusty. Make sure the driveway and surrounding areas are clear so the crews have space to move materials and collect debris. To minimize risks, park on the side of the road instead of on the driveway. Any items that may be shaken loose should be removed until the roof is completed. Click here – to view our handy guideline Prepare for Your New Roof. Depending on the type of product requested, our estimates on average take approximately 45 min. Homeowners or a representative should be at the property during the estimate. Affordable Roofing by John Cadwell, Inc. will not perform estimates at properties without onsite authorization. The answer depends on many factors. Costs will vary depending upon the material chosen, type of ventilation necessary, and the costs of permitting in your area. Roof-Overs – laying a new roof over an existing roof, often costs less than a full tear-off. Mitigating factors, such as the presence of dry-rot, asbestos, or lead-based paint, will also increase costs. When is the best time of year to install a roof? Almost anytime is a good time to install a roof. As long as the temperature is above freezing and there is little chance of snow or rain, a roof can be installed. We work all year long and take extra precautions to ensure that the house stays watertight during poor weather. Some phases of construction can even be performed in the rain, but it’s best to avoid inclement weather. Why do I need a Roof Repair? Missing and damaged shingles or tiles will cause leaks that will cause your plywood or wood to rot and end up with major problems. If water gets inside your house, it may destroy your drywall and personal belongings. So if you see your shingles damaged, missing, they are experiencing leaks of any sort, or any unleveling on your roof, avoid disastrous damage and insurmountable costs and get your roof taken care of today. The key to a roof system’s effectiveness is complete protection. When shingles are missing or torn off, a roof structure and home or building interior are vulnerable to water damage and rot. Missing or loose shingles should be replaced as soon as possible. Signs of bad roofs are damaged or missing shingles, experiencing leaks of any sort or any unleveling to your roof that you may notice. If you notice any blistering or peeling of paint, stains on wall or ceilings, a decay of sheathing siding or stucco may also be signs of the need for a roof replacement. When shingles are old and worn out, they curl, split and lose their waterproofing effectiveness. Weakened shingles are easily blown off, torn or lifted by wind gusts. The end result is structural rot and interior damage. A deteriorated roof system only gets worse with time-it should be replaced as soon as possible. Many apparent roof leaks are usually flashing leaks. Without good, tight flashings around chimneys, vents, skylights and wall/roof junctions, water can enter a home or building and cause damage to walls, ceilings, insulation and electrical systems. Flashings should be checked as part of a biannual roof inspection and gutter cleaning. How to shingle a roof? 1. Tear off the old shingles and replace any rotted wood. 2. Install underlayment, vents, and boots. 3. Lay down the shingles and nail them in. 4. Don’t fall off the roof or get nailed!